The P1 offers the slimmest projector with 200-lumen brightness, compact size, a height of just 33mm, and a native resolution of 1280 x 800. 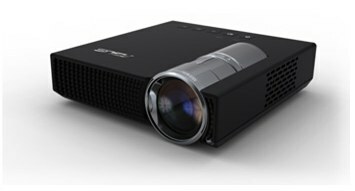 The ASUS P1 LED projector offers a product intended for business and entertainment use with a compact size, a height of just 33mm, 200-lumen brightness and a native resolution of 1280 x 800. It incorporates LED projection technology to help users reduce maintenance costs with its lamp lifespan up to four times longer than conventional projectors. Instant on/off capabilities and power input sharing with ASUS notebooks help make the P1 a great choice for all presentation needs. The P1 offers the slimmest projector with 200-lumen brightness, resulting in a combination of unprecedented portability and extra-bright image quality. The form factor measures 113mm x 33mm x 128mm, more compact than the typical CD jewel case and an easy fit in any briefcase. The P1 weighs less than 400g, and has been designed with productivity and office work in mind, as it can be effortlessly transported between meeting venues. This does not come at the expense of image fidelity: the P1 projects visuals in a native resolution of 1280 x 800 and a short throw ratio of 1.16:1, ensuring compatibility with most notebook PCs. Therefore, a 40” image can be achieved with the projector positioned just over a meter away from the display surface, guaranteeing sharp images that do justice to any application and presentation. Additionally, the P1 uses the same power input used on ASUS notebooks*, reducing clutter by eliminating the need for extra cables and adapters. With plug and play implemented, the P1 features a user-friendly on-screen interface for control settings, and works with a variety of multimedia content sources. It is capable of displaying on screens ranging in size from 15” to 200” for different applications. A 1600:1 contrast ratio allows text and graphics to be shown in crisp and vivid detail. Connectivity with other devices occurs via a wide I/O range, including USB 2.0, composite and VGA. The built-in SD card reader and integrated media player interface provide additional means to view content independently of a PC. For audio output, the P1 includes a high quality 2-watt speaker**. The LED lighting design applied in the P1 promotes conservation in comparison to traditional lamp projection technologies. It enables instant on/off switching with no prolonged warm-up or cool-down periods, leading to cost savings for consumers as well as a faster, more readily-accessible product. The use of mercury-free LED lighting further prolongs component lifespan, eliminating the need for frequent lamp replacement and offering users the benefit of reduced operating costs while protecting the environment. The P1’s design ensures a lamp life of around 30,000 hours, approximately four times longer than conventional products. Total power draw averages a low 50 watts.